The ability to appreciate music seems to be part of the fiber of what it means to be human. Each week, believers gather in churches and synagogues to sing the hymns of ancient faith. On the other side of town, jersey-clad believers of another kind stand in stadiums and sing their teams’ fight songs. Think for a minute about the impact music has had on your life. Chances are, you associate a certain song with a first romance (or a breakup). You probably had a soundtrack behind your studying, and playlists for relaxing in your bedroom or for hanging out with friends. Today, you might have a playlist of songs for your workouts… or just for work. Can I get a job in this field? How do I become an Elementary School Music Teacher? Even biologically speaking, music is a non-negotiable part of the human experience. Studies bear out that listening to and practicing music strengthens the human mind. Children exposed to music education perform better on reading tests than peers who didn’t enjoy the benefits of music education. 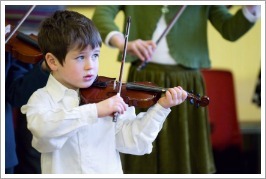 Children who appreciate and practice music also experience accelerated synaptic development. This is significant because brain development operates on a “use-it-or-lose-it” economy, which scientists call “pruning.” Music generously engages multiple areas of the brain, including the sensory system, cognitive system, planning system (which includes fine and gross motor skills), and the hedonic/motivational system (the brain’s pleasure center). Thus, by pursuing a career as an elementary education music teacher, you not only have the opportunity to enrich children’s lives but contribute to their cognitive development. When a child is introduced to good music, we give them more to be human with—and help them succeed in life. There’s any number of ways to take your young students into a deeper knowledge of music. You’ll likely begin by exposing students to a wide variety of music—classical, country, folk, jazz, R&B, Broadway show tunes, rock, and any other styles that interest you or your students. You help the children learn songs from different musical genres. You might even watch videos of styles of dance that match the different music genres—such as ballerinas dancing to classical or jazz, or dance scenes from Broadway and/or rock musicals—to help them make the connections between melody and rhythm. Your class time is also an opportunity to help students realize how much music is a part of everyday life. Play songs from popular television shows, movies, and commercials, and help kids make the connections. In many cases, you might be able play the original song, and thus introduce them to a bit of musical history. You could also discuss with kids the fact that music not only makes life more interesting but helps us learn things more quickly and easily, and ask them to come up with examples of their own when that’s happened. As with all varieties of elementary school instruction, being a music teacher requires long hours. At most schools, teachers arrive at least one hour before students, to touch base with administrative officials and to make last-minute preparations for the day. Evenings are frequently filled by grading papers at home and writing lesson plans. As a rule, music teachers work with multiple grade levels of children, but prepare a single lesson plan for each grade. This way all kids are exposed to the same kinds of music and to basic music theory, regardless of how much musical expertise they might have outside of class. In addition to these general music classes, music teachers often direct grade-school choirs, bands, and orchestras. In smaller school districts, or in money-strapped districts, music teachers find themselves splitting instructional time between two or more schools. In these cases, teachers are hard pressed to offer more advanced vocal or instrumental experiences for the students, and instead are forced to focus their attention solely on basic music classes. Because of the current economic outlook, the job outlook for elementary music teachers is equally unclear. Music: In the music format, the teacher shows students how to read notes off a staff, identify the bass and treble clef, identify the key signature, and the time signature. Beats: In the beat format, the teacher helps the children feel and count of the beats in the music, so they can properly identify when individual notes should start and end. Rhythm: In the rhythm format, the teacher helps children identify the rhythmic patterns that are created and woven around the basic beat of the song. Pitch: Identifying pitch is the ability to differentiate the sound of one note from the other. Teachers start out by using a numbering system to help their young students learn notes, then graduate to solfeggio (do, re, me, fa, so, la, ti, do) as students mature. According to the U.S. Bureau of Labor Statistics (BLS), employment opportunities for elementary school teachers are growing at a rate of 17 percent annually, roughly the projected growth rate for new jobs in general. However, most elementary schools only have one music teacher for the entire building, which makes finding employment more challenging. Additionally, many school music programs have found themselves either abandoned or scaled back, due to cuts to the school budget and the increased emphasis on school accountability and standardized testing. Thus, it’s not uncommon for music teachers to pursue multiple teaching certifications, so that they’re able to teach other subjects as they wait for a music-teaching position to open. It’s also not uncommon for teachers attempting to break into the job market as substitute teachers. Substitute teaching not only builds a teacher’s work experience, but allows educational administrators to build familiarity with the teacher and assess the potential for a fit within the district. Networking with a professional teacher organization can also help teachers build connections with potential employers and coworkers, as well as make their resumes more attractive. Aspiring music teachers could also serve as volunteer assistant band directors, or to gain experience in church children’s choirs, as ways to enhance their resumes and set themselves apart to potential employers. Teach for America is a national organization committed to placing teachers in high-need areas of the country. Some teachers have qualified for student loan forgiveness by teaching in qualifying economically distressed school districts. It’s also beneficial to see explore which states offer teaching fellowship programs. The benefits of these programs vary, but some states will fund a teacher’s education in exchange for a commitment to teach in that state for a specified duration. Teachers may need to be willing to relocate in order to find work. The BLS reports the teacher job market will grow the fastest in the South and West. However, it should be noted that not all states share reciprocity with teaching licenses. When considering relocating, it would be wise to visit the Teaching Certification website to learn the requirements of your target state. The medium annual wage for elementary school teachers is $51,600. One can expect salaries to vary by school district, state, and the educational and professional experience of the applicant. First-year elementary school teachers can expect to make between $25,000 and $33,000 annually at a public school, and less in a private school setting. Earning a master’s degree can increase one’s entry-level salary; on average, teachers see salary increases of up to 15 percent over those only holding bachelor’s degrees. Also, a master’s degree helps teachers distinguish themselves in a competitive job market, as it demonstrates a command of teaching techniques and musical theory—both of which will be needed on the job. The process for becoming a music teacher is involved. Classes in the musical education program ground the future teacher in music theory and pedagogy, as well as provide instruction in playing several musical instruments. The program also gives the prospective teacher the general content and pedagogical knowledge they’ll need to teach children. Every state requires that public school teachers at least have a bachelor’s degree in music education, as well as state teacher certification. For more information on the certification process, including information unique to each state, visit teaching-certification.com. Teachers are lifelong learners. By sharing this attitude with your students, a music teacher can implant the joy of music into the hearts of his or her pupils, forever.